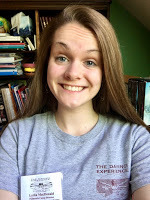 This is Lydia’s third year with DaVinci Experience Summer Camps, and she is absolutely thrilled to be back. Lydia has nearly a decade’s experience working in summer camps. Before joining the DaVinci team, Lydia spent seven years working at a children’s theater Brunswick, where she organized and implemented many of their summer programs. She has also created and taught a Fairy Tale Theater curriculum in Yarmouth. Lydia has a passion for teaching and has experience in grades PreKindergarten-Fourth.